Revitalization conducted at Arsa Park by PUPR Ministry, Untung Jawa Island, South Seribu Islands, now reaches 90 percent. This revitalization has been started since 2016 after government established Arsa Park at Untung Jawa Island Urban Village, South Seribu Island to be the National Tourism Strategy Zone (KSPN).
" Currently, Arsa Park revitalization in Untung Jawa Island Urban Village, South Seribu Island reaches 90 percen "
Untung Jawa Island Urban Village Head, Ade Slamet mentioned, this revitalization is done to develop tourism in the area and attract more tourists to visit Seribu Islands. "Currently, Arsa Park revitalization in Untung Jawa Island Urban Village, South Seribu Island reaches 90 percent or now it is entering finishing phase for toilet and sport facilities," he informed, Thursday (12/13). 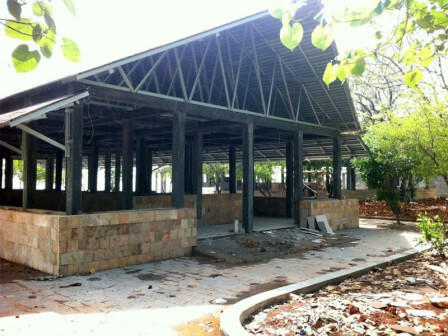 In revitalization process, 50 kiosks are also built for merchants in Untung Jawa Island Urban Village. There are merchants who sell snacks, culinary, souvenirs, and water sport tourism attraction service. "Our target is to finish revitalization in December thus it can be used for New Year's Eve event, " he added.